Many years ago, when I compiled the multicultural children’s bibliography Our Family, Our Friends, Our World and edited MultiCultural Review, I had the privilege to work with many of the leading advocates for diverse children’s books at the time. We discussed reviewing books that had both positive and problematic portrayals and how to address these in the review. At the time, the general consensus was to highlight the meritorious aspects of the books as well as showing the specific ways these books could have done better. I still support that approach, even though many of my activist colleagues have called for zero tolerance of problematic representation. I also believe that authors and publishers have the responsibility to make sure problematic representation doesn’t occur by using targeted readers — often called “sensitivity readers” — and making a concentrated effort to publish books by Own Voices marginalized writers. But Own Voices writers don’t — and shouldn’t — restrict themselves to their own marginalization. Authentic characters are intersectional characters with multiple identities and challenges, and authentic stories have a variety of characters that reflect the diversity within communities. In the past few years, I’ve read several books with secondary characters on the autism spectrum written by neurotypical authors. I served as the targeted beta reader for one of them, Cordelia Jensen and Laurie Morrison’s middle grade novel Every Shiny Thing. 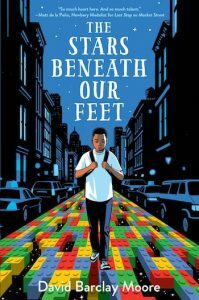 More recently, I read David Barclay Moore’s middle grade novel The Stars Beneath Our Feet, a book for which I didn’t serve in this capacity. 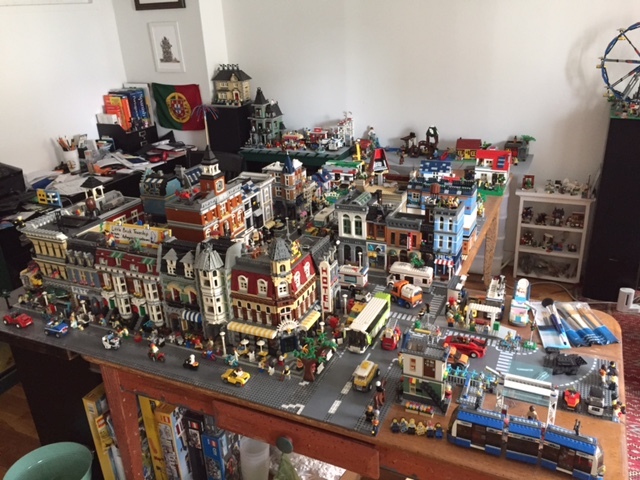 For many years I’ve been a Lego builder, creating a town with a combination of Lego kits and buildings of my own design that fit in with the classic appearance of the Modular themes. 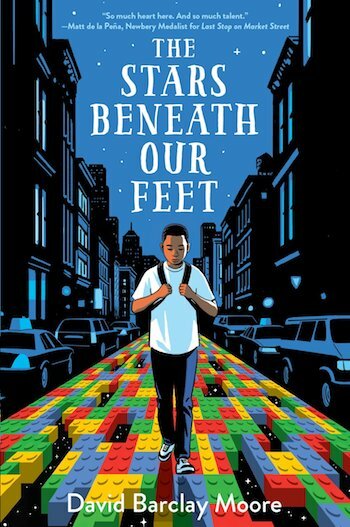 Because of this interest, I was particularly eager to read David Barclay Moore’s debut middle grade novel The Stars Beneath Our Feet, which portrays a 12-year-old boy in Harlem using Lego to confront his grief after his older brother’s violent death and to reach out to an isolated homeschooled girl who attends the same afterschool program. Wallace “Lolly” Rachpaul has been in a tailspin after Jermaine’s death, alienated from his Trinidadian parents and thinking of joining his brother’s old gang for protection. When his mother’s girlfriend (his parents are divorced and his mother has come out as a lesbian) brings home bags of Lego pieces from her job as a cleaner in a toy store, he finds a new outlet – an imaginary city called Moneekram. When his city outgrows his small apartment in the St. Nicholas Projects of New York City, he brings it to the community center and sets it up in the storage room, where he is soon joined by Big Rose, a withdrawn homeschooled girl one year older who shares his interest in Lego and architecture. Over the next months, he and Rose explore the real city as their creation grows, but dark clouds loom in the form of gang members who are threatening Lolly, a best friend who is himself tempted after a violent mugging, and the loss of the storage space to another tenant. Lolly is forced to make dangerous choices as he fights to keep both his Lego buildings and his friendships. Moore deftly parallels Lolly’s real life and the fate of his Lego community. Moneekram is a refuge from his daily stresses, but the world continues to intrude, and he cannot hide forever from the difficult choices he has to make. Early on, readers hear of an argument between Lolly and Jermaine that took place the afternoon before Jermaine’s death, and although we don’t know what happened until the end of the story, one suspects that it had to do with the temptations of gang life. Moore approaches this conflict with nuance and sensitivity; in his situation, there are no truly safe choices. Big Rose, who readers come to realize is on the autism spectrum despite her vehement denials, is believably drawn. As a Lego builder on the autism spectrum, I recognized her deliberate and realistic building style as she tries to get the details right. I do have one concern about the ending – the fact that Rose is sent to an inappropriately restrictive and unstimulating placement but one portrayed as where she belongs. In the course of the novel, Rose comes out of her shell as she builds the town with Lolly. She carries on a conversation with him, and with other characters, whereas before she would mainly use her fists. She travels on public transportation, shares photos, discusses her favorite buildings and Lego building techniques. She brings Lolly to her home (even though her grandmother is a bit of a hoarder), loans him books, and discusses Phillis Wheatley and other famous Black poets with him. She comments on others’ behavior by reciting lines of poetry, a technique Lolly picks up. My Lego town, Little Brick Township, combines kits and original creations in a realistic style drawn from historic buildings. But at the end, when Lolly sees Rose in the suburban school with her new “special needs” classmates, he thinks of how much she changed him and how he is a better person for having known her. He doesn’t question her situation to the adults or make the case that she needs to get out of there. After all the character growth appearing throughout the story, in the end Rose becomes a second fiddle. Since the publication of The Stars Beneath Our Feet, I’ve noticed several other book deals that feature neurotypical protagonists with autistic secondary characters. I worry that these portrayals with backslide into the second fiddle trope, stereotype autistic characters, or normalize their exclusion and institutionalization. It is painful for me as an autistic person who managed to avoid restrictive placement to see people like me depicted in these ways. As an autistic writer, I fear that these problematic portrayals will become part of the canon and my Own Voices work will be drowned out or dismissed as inauthentic or wrong because it doesn’t conform to the canon. I also fear that this image of autistic people will be used to deny my capability to write compelling fiction and to fit into the publishing world. I appreciate the people who have asked me to read manuscripts ahead of time to make sure they have created a sensitive and nuanced understanding of autism. I also hope that we’re invited inside to tell our own stories. Update: For two years the Writing in the Margins website hosted the Sensitivity Readers database, but as of March 1, 2018 is no longer doing so. However, if you’d like more information about sensitivity reads, please contact me via the Contact page or @ me on Twitter, @LMillerLachmann.